Making coffee with a long steep in lukewarm water creates a smooth, strong brew that is perfect for mixing with chilled milk or more water for a wonderfully refreshing glass of iced coffee. I am a huge fan of iced coffee during the hot months so you know I said yes. Jayne’s ultimate coffee is everything that she promised. Not that I doubted her. Jayne and I have been friends since way back in 2002 when we both got sucked into the International School of Kuala Lumpur PTA executive committee as newbies to KL. She is the type of person who always goes that extra mile for any job, paid or volunteer, and treats everyone with utmost generosity and kindness. It has been an honor to call her friend for all these years. 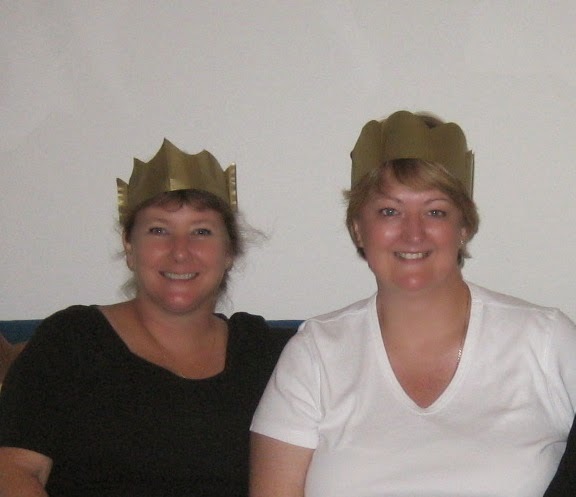 With my friend Jayne at our Christmas in July celebration 2006. Mix your water and coffee together in a big jug or cafetière and leave to steep for 12 hours. Pour through cheesecloth to get rid of the grounds. I scooped all of grounds out of my jug into the cheesecloth at the end and squeezed all of the steeped coffee liquid out, to get every last good drop. Says Jayne: Serve one part coffee to two parts water or milk, over ice cubes. You can make it stronger if you like, equal parts coffee and water/milk, but I love the flavour, it's so intense. Sweeten with homemade simple syrup, if desired, and enjoy! I didn't want to mess with making simple syrup so I add one teaspoon of sugar to my glass and just a little warm water to dissolve it. After it's dissolved, add the ice cubes and the coffee. Top up with milk for iced latte or more water for iced coffee. When you think about it, (or is that just me?) almost anything can be made into a muffin, including a chili cheese hot dog: Spicy chili, sharp cheddar and hot dogs baked in a muffin then topped with more cheese, onions and mustard. Happy Memorial Day! This week I am channeling Coney Island and bringing you a chili cheese dog muffin, in honor of Memorial Day, the holiday when we Americans honor and thank the members of the armed forces who sacrificed their lives in the line of duty to protect our nation. It is also the kickoff to hot dog eating season. Not that we can’t and don’t eat them year round but according to Forbes.com Americans eat an incredible seven billion hot dogs between Memorial Day in May and Labor Day in September. No telling how many of those are chili cheese dogs. But this year at least, a few of them will be muffins. Note: I used homemade beef chili that is very thick, mostly meat, cooked down till there’s not much liquid left. If you are going to use store-bought or juicier chili, cut back on the amount of water. Preheat your oven to 350°F or 180°C and prepare your 12-cup muffin tin by spraying with non-stick spray or lining with muffin papers. If you have a kind and generous mother like mine, see if she’ll volunteer for a Dollar Tree run to buy paper liners with little blue and red stars. You can pay her back in chili cheese dog muffins. Grate your cheddar if it didn’t already come grated and finely chop your onion. Set aside a handful of the cheese for topping. Slice the hot dogs into small circles and set aside 12 to poke into the tops of the muffins before baking. Combine your flour, baking powder, baking soda, salt and cheese in a large mixing bowl. In another smaller bowl, whisk together your eggs, oil, chili and water. Toss in the big pile of hot dog circles and stir again. Sprinkle the tops with the reserved cheese and chopped onions. Add one reserved hot dog circle to each and push it in just a little bit to make it stick. Drizzle with a little yellow mustard, if desired. But I say, what’s a chili cheese dog without a generous drizzle of mustard? Now go shake a soldier's hand and thank him or her for her service. And pray for peace and that no one need ever make the ultimate sacrifice. And perhaps bake some muffins to share. Homemade marshmallows are actually quite easy to make but I have to warn you that they will spoil you for store-bought marshmallows forever, so wonderful are they. I have a few things on my bucket list that I want to make some day. Real puff pastry, ice cream, my friend Ishita’s mustard fish, marshmallows and Jamie Oliver’s wine-braised chicken with grapes, just to name a few. My friend Jenni Field, of Pastry Chef Online, dreamed up an ice cream challenge that would take care of two of those in one fell swoop. She wanted to take her Ice Cream Tuesdays to another level by adding marshmallow in some form and invited a group of us to join her. I could have taken the easy way out and used store bought but I figured it was time to step up and do the marshmallows myself. Store bought marshmallows are light morsels best set aflame and eaten in front of a campfire, with sticky fingers and ash. These homemade ones are their distant ethereal cousin, the one that shows up at the wedding and makes the groom reconsider his commitment to the bride. The groomsmen fall all over themselves to seat her and the bridesmaids all want to be her. Elderly relatives all nudge each other and remark with awe, how she has grown and blossomed since they last saw her as a gangly, awkward preteen at the family reunion years ago! But you know what? She’s sweet and unassuming, not brash or overbearing, a genuinely nice person that everyone can’t help but like. May I introduce my almond marshmallows? I think you are going to like them. Toast your almonds in a small heavy skillet over a medium low flame. Toss or stir the nuts frequently to prevent scorching. The almonds are properly toasted when they are light brown and smell wonderfully nutty. Set aside to cool for a few minutes and then pulse in a food processor until you have small toasted almond crumbs. Dissolve your gelatin in the cold water in the bowl of your stand mixer or another mixing bowl if using a hand held mixer. My gelatin was made in New Zealand. I have no idea why it is brown but when dissolved, it turned clear. Whew. Add the salt and almond extract to the mixing bowl with the water and gelatin. Stir well. Meanwhile, mix your powdered sugar with your cornstarch and set aside. Spray a half-sheet pan with non-stick spray. Line the pan with cling film, making sure it goes up the sides of the pan as well. Make sure you don’t have any bubbles under the cling film. You want the cling film stuck tight all over the pan. Now spray the cling film with more non-stick spray and put it on thick. Use a sifter or strainer to cover the whole pan with a good layer of the powdered sugar/cornstarch mixture. Sprinkle half of the ground almonds over the cornstarch/sugar mixture. Set the pan aside. In a medium sized heavy bottomed pot, Stir your sugar and corn syrup with about a tablespoon and a half of water and bring to a low boil. Put the lid on and cook for two or three minutes more. Remove the lid and put your candy thermometer in the liquid. Heat till 244°F or 118°C. When your syrup reaches temperature, pour it carefully down the inside of your mixing bowl. If you are using a stand mixer, use the whisk attachment or beat on medium for a few minutes. Once it’s all mixed together, turn the knob to high and beat until the mixture triples in volume. This is such fun to watch, as the clear liquid turns to fluffy white stuff. Use non-stick spray to coat a rubber spatula and use it to scrape the beautiful sticky white stuff into your prepared pan. Spread the marshmallow cream evenly around the pan, using more spray on your spatula whenever necessary. Now spray the top of your marshmallow cream liberally. Sprinkle on the rest of your toasted almond crumbs. Now use your sifter or strainer again to cover the top of the marshmallow cream with a thick layer of the powdered sugar/ cornstarch mixture. No shiny marshmallow should peek out. Put it on THICK! Don't be shy. Set aside, uncovered, for several hours in a cool dry place to set. When the marshmallow feels spongy yet firm, cut it into squares with a greased knife and coat all the sides in more powdered sugar/cornstarch to stop the pieces from sticking together. 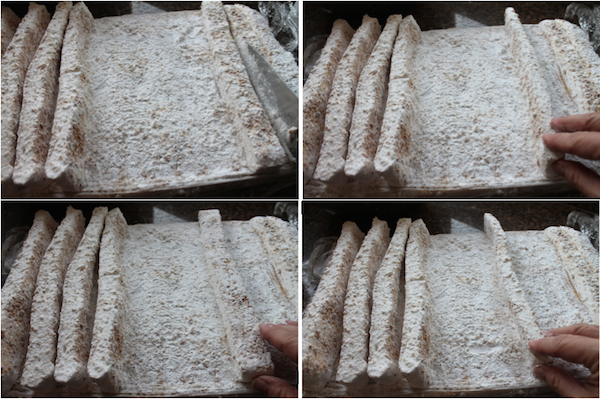 A little tip: After you have cut a few slices and removed them to a big bowl with powdered sugar/cornstarch, you can cut the following slices and roll them over and over on the cling film, which will coat the long cut sides. Since you put a healthy layer of that stuff in the pan, right? Then you just have to coat the short sides as you cut the long pieces into squares. Jenni was right. These marshmallows are like a whole different thing, compared to store-bought marshmallows. They are soooo good. And soft and fluffy and nutty and divine. She's made a wonderful video of her making marshmallows live that you should watch too. 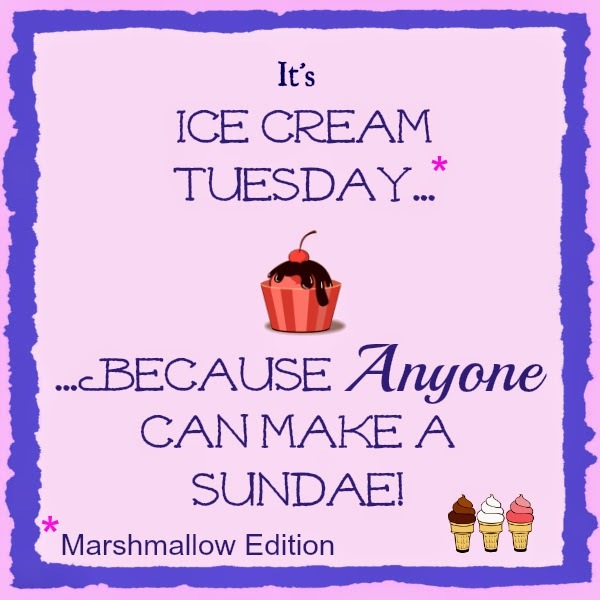 Check back this Tuesday when I’ll be putting some of them in homemade no-churn (no ice cream machine needed!) 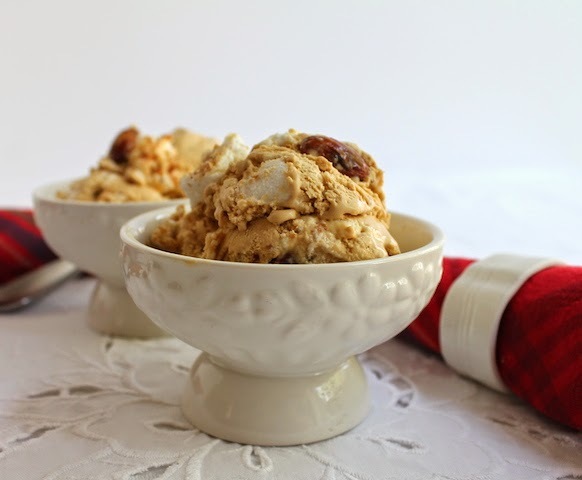 coffee Amaretto ice cream, along with some candied almonds. But don’t worry, this makes plenty enough marshmallows just to eat straight. If it just happens to be your helper's seventh birthday when you are making these, share a couple with him.